Chair massage is a great addition to your next corporate or personal event. 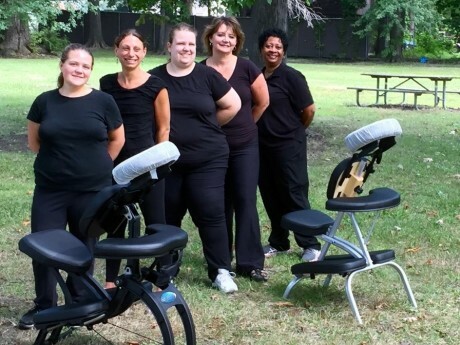 Michigan chair massage services are available throughout the Michigan area for corporate wellness programs, employee health fairs, employee appreciation, customer appreciation, trade shows and expos, merchandising services, bridal parties, baby showers, retirement parties, birthday parties and more! Chair massage is a worthwhile addition to your corporate wellness program or a great gift for employee appreciation events. Our mobile chair massage services are available on-site at your office. Employees appreciate the opportunity to easily reduce their stress and pain. Our therapists use a combination of chair massage therapy techniques such as swedish massage trigger point therapy, myofascial release, and stretching. Massage therapy helps reduce muscle tension in the body decreasing chronic pain and stress. Tightness in the muscles can contribute to headaches, sciatica, tendonitis, and low back pain. Chair massage has many therapeutic benefits for your employees. Massage techniques are used to reduce back and neck tension which can contribute to headaches, back and shoulder pain. Chair massage incorporates techniques to reduce repetitive motion pain and tension in the forearms and hands. Therapists can incorporate stretching into the routine as well releasing shoulder and chest tension. Make chair massage available for your employees on a weekly, bi-weekly or monthly basis for health maintenance and stress reduction. Providing chair massage at your trade shows booth, marketing and corporate events draws an audience and provides great exposure for your products and services. It is also a great way to say “Thank you” to your vendors and customers. Your company representatives have an opportunity to interact and develop relationships with prospects and deepen relationships with vendors and customers while your guests are waiting their turn for a massage. Our therapists can support your marketing efforts by communicating your marketing message and distributing marketing materials at the events.